No pictures today, no food. I am heartsick. A blogger friend had her baby girl, Lillian Grace, earlier this week, at just 22 weeks, who took a few breaths before she left this world. Yet another reminder of just how tenuous this whole pregnancy thing is. Just three and a half months ago or so, a while after I'd been diagnosed as IF by my ob/gyn, before I was pregnant myself, I'd sent Rebecca a package with tea for nursing mothers, and some Belly Bars, thinking positive thoughts about her pregnancy, maybe pinning my hopes on her new life if I wasn't going to be able to produce my own. I was happy for her, in a way that I wasn't even able to be happy for my first-time-pregnant colleagues, who were everywhere at the time. I followed her blog, watching her belly expand. It was hard to read her news today. I still have a lump in my throat that I can't quite swallow. Another (real life) friend, who reads this blog, had a stillborn baby before her two successful pregnancies. She is an amazing mother and a thoughtful, insightful, compassionate friend, and I thought about her this morning, too, and her own lost child, reading all of the outpouring of love and support for Rebecca, wishing again that I'd been a better friend to her back then, grateful for all of her support through my own losses and now my pregnancy. Today, this is what I'm thinking: we need to be kind to each other. We need to be able to talk about (or at least be present to) sad, unimaginable things in the way that we celebrate the joyful ones, to remember the losses as we remember the birthdays, not because we should dwell on what is depressing, but because death is a part of life. We are such strange, half-invisible creatures sometimes, hiding our shadows. Though the Bhagavad Gita tells us not to feel sorrow because death is inevitable, part of the great cycle of life, I believe that as much as we can cultivate detachment, we are still human. And to me, while maybe detachment is a good thing sometimes, part of living is also cultivating that connection to others that will allow us to feel joy and pain together, that makes us realize, perhaps a little bit differently, how we're part of the interconnected web of being that the Gita also describes. 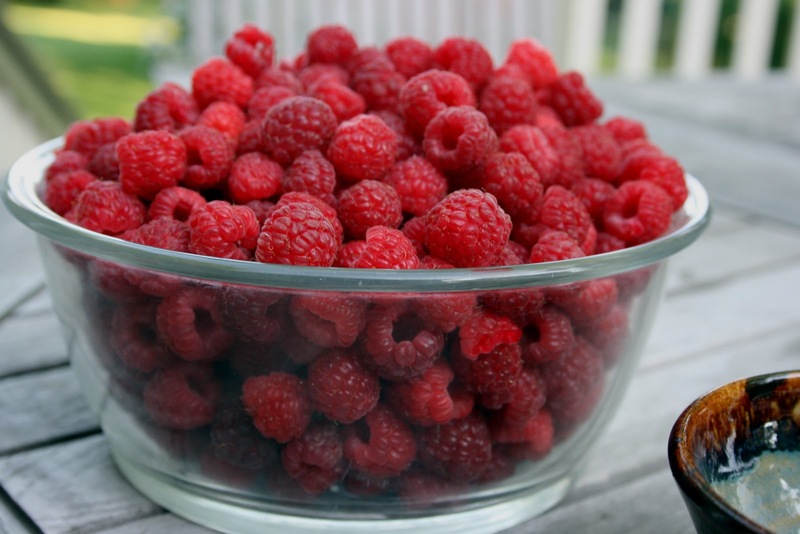 Have you ever picked raspberries? I realize I talk about them a great deal on this blog, but you'd understand if you'd been swimming in them, too. I promise, it will end soon. The first harvest is already petering out. My point, though, is that when you're picking raspberries, you can't just look for them from the top. That's where you start. But then you have to gently separate the canes, and finally, when you think you've found all of the ripe ones, you have to squat beneath them and look up. It's like a whole new world every time. All you need is a little change of perspective. In my youth, I associated orzo with rice pilaf. I had no great love of rice pilaf. It came from a box, and somehow often had burnt onions in it. But when I arrived at graduate school at UCLA, where my fellow students introduced me to real creative cooking, I found salads of orzo studded with crisp bright vegetables, orzo with exotic spices ... suddenly I developed new appreciation for the humble little pasta shape. New perspective. Though I've been cutting back on things like bread and pasta for a while now (almost never eating it for dinner), and when I do make pasta, it tends to be something in the whole wheat or spelt family, our CSA sent us this recipe, and I figured I'd give it a go. I made it last night for tonight's dinner (which is something I do pretty regularly, given that I rarely get home before 5:30 and we like to get dinner on the table by 6:00 so the night doesn't drag out too long for Ian), and found myself sitting in front of the mixing bowl, chowing down uncontrollably before I put it away. 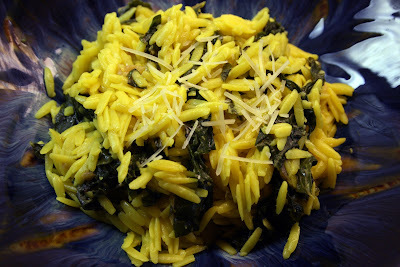 It turned out a little like risotto, but lighter; the lemon/garlic sauce was a perfect complement to the kale. 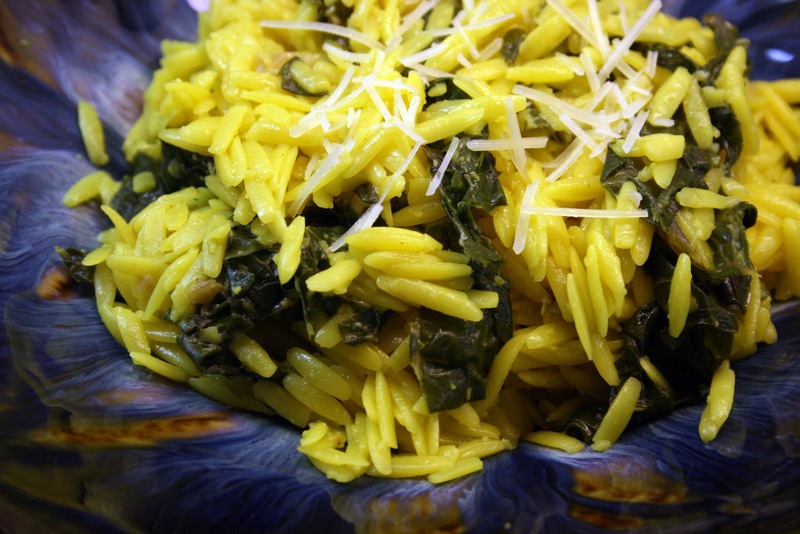 The turmeric doesn't offer too much flavor (a little nutty perhaps), but makes the orzo a beautiful color. We went light on the nutmeg because Steve doesn't like it. But who can argue with fresh grated Parmesan? That, right there, is the reason I could probably never be a vegan. Bring a large pot of lightly-salted water to a boil; sprinkle the turmeric over the boiling water and stir in the orzo; return to a boil. Cook uncovered, stirring occasionally, until the pasta has cooked through, but is still firm to the bite, about 11 minutes; drain. Scrape into a mixing bowl and set aside. Heat the olive oil in a large skillet over medium heat. Cook the garlic in the hot oil for a few seconds until it begins to bubble. Stir the kale into the garlic, dump in a little bit of water to prevent the kale from crisping, cover the skillet with a lid, and cook for about 10 minutes (checking occasionally to see how things are moving along). Remove the cover and continue cooking and stirring until the kale is tender, about 5-10 minutes more. Stir the kale mixture into the orzo along with the lemon juice, nutmeg, and Parmesan cheese. Season with salt and pepper. Serve warm or at room temperature. Today I had a visitor from New York, a photographer named Megan Joplin working on a project called The Miscarriage Diaries (I hope she doesn't mind me linking to it here, since it's already been posted elsewhere on the internet). She hopes, through the project, to make miscarriage something more public, something we can talk about out loud, by someday having a gallery show, but also to help women to commemorate their losses. She lost four pregnancies before having her own son, so it is something she understands all too well. I found out about her project through a link on a website one day, and emailed her to tell her how much I admired her for doing this important work; somehow, we decided that I would participate, and we'd been trying to find a date to get together ever since. It was amazing to finally meet her, and she was everything I'd suspected her to be: smart, funny, warm, thoughtful, compassionate. We spent the morning walking to the farmers' market and talking. I confessed to her that I am pregnant, and she understood immediately how that felt; how it was both happy but not entirely real, how it might not even really be real until I held a live baby in my hands. I told her about being in the ob/gyn office, and we wondered together why health professionals don't seem to be trained to talk about pregnancy loss. She took some pictures of me alone and with Ian (a few even with a Polariod camera) by our barn and our garden, and at the farmer's market. 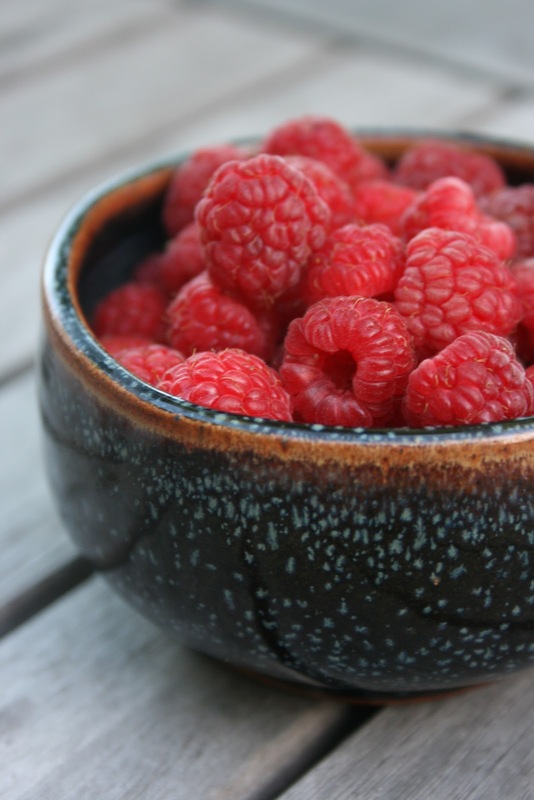 I held my son, a tomato, and a colander of just-picked raspberries. It was funny, thinking about myself this way, with the barns in the pictures behind me: how I've become part of the landscape of Hunterdon County, and how growing things and appreciating growing things now defines me, and in some ways defines my relationship to pregnancy, almost chronicles my own journey. She's clearly a talented photographer; the Polariods were really lovely, I felt completely at ease, and I felt like doing this really meant something. Like I was bearing witness, and asking the world to bear witness with me. We made her stay for lunch (I couldn't send her back to Manhattan without feeding her, especially since she made a pilgrimage to Butterlane for me), and threw together a salad with roasted beets that we'd gotten in our CSA box this morning (thank you, Megan, for helping us with our little leafy greens problem). 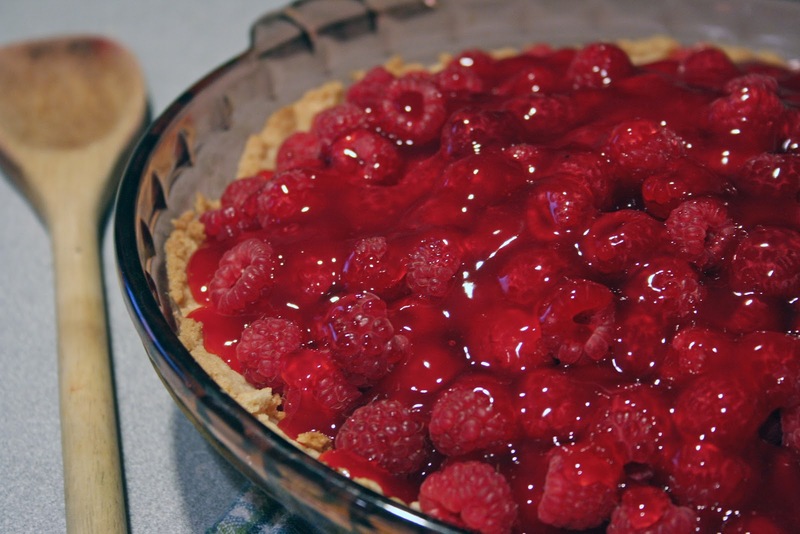 For dessert, of course, there was fresh raspberry pie. I've now made three raspberry pies, we've eaten countless berries for breakfasts and snacks and desserts, and given away a few pints, and still the bushes are producing. I'm no longer picking two quarts per night, but there's enough to do something more with than simply eating. I'm almost out of muffins for my grab-and-go sort-of-queasy breakfasts, so I made some raspberry muffins that I could freeze (unfortunately, the picture doesn't do them justice like my photographs usually do). Though I didn't force muffins on Megan as she made her way out the door (I'd already given her lettuce and a small container of berries), I hope that her project, too, bears fruit in the way that our bushes have this year: that her photographs are on the minds and lips of many people, long after the growing season is over. Heat oven to 375 F. Grease bottoms only of 12 muffins cups or line with paper baking cups. In medium bowl combine flour, baking powder, salt and lemon peel; mix well. 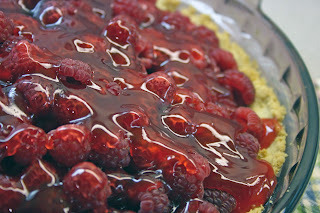 Add raspberries - mix gently with a fork. In a small bowl, combine agave nectar, milk, oil, vanilla and egg; blend well. Add to dry ingredients; stir gently just until dry ingredients are moistened. Fill greased muffins cups 2/3 full. Sprinkle with a little bit of extra sugar if you're going to do so. Bake for 15-17 minutes or until light golden brown. Cool 1 minute; remove from muffin cups. Serve warm. Picking berries is oddly meditative. The sound of round ripeness dropping into the pail. Thunk, thunk, thunk. Looking to find next bunch, gently separating the canes to see better inside: pluck, pluck. You become connected to the bush, somehow. There is a rhythm to berry picking unlike anything else I've ever done. Tonight, I kid you not, I picked two quarts of raspberries from the bushes in our back yard tonight. This in addition to the quart I picked yesterday, and the quart I picked the day before. We've been giving them away and eating them like mad, but with a long weekend trip coming up, I had to think fast. Fresh raspberry pie, I decided. Uses the most raspberries, preserves them in their most pristine form, probably uses the least amount of sugar. If I were really doing this right, I would have found a sugar substitute, but sometimes you just have to go for the jugular. For the crust, a shortbread. Mix with a fork softened butter, salt, confectioners sugar, and flour. When it has the consistency of cornmeal, press it into a pie plate (I used 9.5 inch), prick with fork, and bake empty at 425 degrees 10-12 mins. Check at minimum time as this crust burns easily. In a saucepan, crush berries. Add water; simmer for 3 minutes. Strain, reserving juice; discard pulp and seeds. Add enough water to juice to measure 1 cup liquid. In a saucepan, combine sugar, cornstarch and salt. Slowly stir in raspberry liquid. bring to a boil; cook and stir for 2 minutes or until thickened. Remove from the heat; cool slightly. Then, fresh raspberries. As many as you can fit into the shell. I think I mounded just about 1.5 quarts in there. Pour the glaze over, and chill 2-3 hours or until set. Lick fingers, pots, and bowls. Ponder with amazement the universe that made berry bushes. The other day a neighbor from our block mentioned to me that she was going in for surgery last week to remove fluid in her chest. This is the second time she's had the procedure done. Before that, she's had treatments and finally surgery for breast cancer. She's truly an amazing woman, and last time she went in for surgery, I meant to bring down a meal to help out, but got swept away in my own calendar. This time I was determined to help out, and I was glad that she gave me the chance to do so. I was trying to think about a meal that would feed her family of five (including three teenagers), but that would still be somewhat healthy, not too spicy (because sometimes when you're recovering you just don't want a plate of enchiladas), but still flavorful. I finally decided to make chicken piccata (the first non-veg meal I've made in quite some time, come to think of it), a zucchini risotto, and a bountiful salad (there's the lettuce), to get rid of some greens and radishes, and possibly the fennel bulb (which was too small to do much with besides put it in something else, anyway). 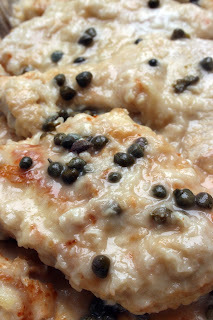 Chicken piccata was the first quasi-fancy dish I learned how to make entirely without a recipe book, so making it always makes me feel like a professional, especially when the wine hits the pan in the deglazing step. It occurred to me as I was cooking that it's been a while since I've made a meal like this for our family. I mean, sure, I make dinner all the time ... we rarely eat out ... but the three-course fancy starch with meat protein and vegetable seems to make an appearance less often at our table these days. I helped myself to some bits of the piccata and a spoonful of the risotto, savoring the creaminess on my tongue. It was perfect. In the 2-quart sauce pan, bring the vegetable broth to a simmer. Keep it hot but not boiling. In the 3-quart sauce pan, heat 1/4 cup olive oil over low heat. Add the onion and sauté slowly until soft. Add the zucchini and garlic and sauté over medium heat for 2 to 3 minutes (you can also add the zucchini towards the end, about 2 broth additions before the cheese, but it's up to you). Add the rice and stir until the rice is translucent, about 1 to 2 minutes. Reduce temperature to low. Add wine and stir until almost absorbed. Add the hot broth to the rice mixture one ladleful at a time, stirring frequently. Wait until the liquid is absorbed before adding the next ladleful of broth. Midway during cooking, add the basil and salt and pepper to taste. Continue cooking until all the broth has been added. 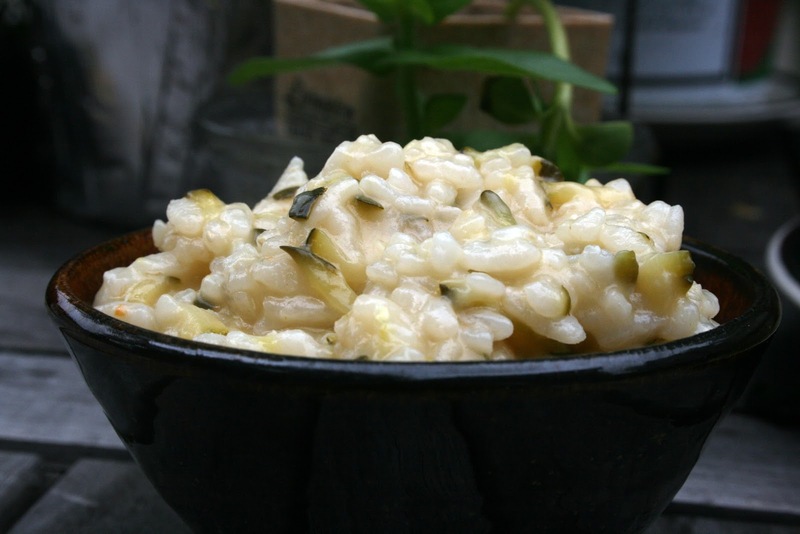 Test the risotto to make sure it’s al dente, but not too hard. If it’s still a little crunchy, add a ladleful of water and continue stirring. When risotto is ready, remove from heat and stir in the remaining 2 tablespoons of olive oil and the cheese. Serve! Heat oil over medium heat in a large pan. Dredge chicken in a mixture of flour, paprika, salt, and pepper. Working in batches, brown chicken on both sides, and remove them from the pan. When you're done cooking the chicken, pour some wine into the pan. It should be about a 1/4 inch deep, depending on how big your pan is. The wine will make a lovely sizzling noise and if you put your nose over the pan, you'll get to appreciate the wine vapors. Add the lemon juice, and stir to combine. Add the butter (perhaps 2 T., but start with less and add as you need to). Once it no longer tastes too acidic, return the chicken to the pan. You'll notice the sauce start to thicken and turn creamy. 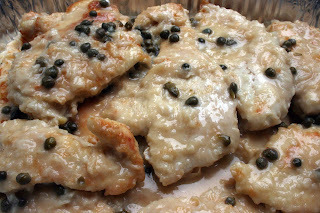 Add your capers, make sure that the chicken is cooked through and that each piece has had a chance to swim in the sauce, and serve. I could have pretended I wasn't anxious, but it wouldn't have made a difference. Today was my long-awaited appointment with the Ob/Gyn. I was prepared for the worst. No heartbeat. Ectopic pregnancy. Irregular heartbeat. Chemical pregnancy. But there it was on the ultrasound, a little heart beating away steadily at 133bpm. Wow, I said, under my breath. Just wow. I was not an easy patient today, I think. The perky, chatty nurse took me into the examining room, and told me to pee in a cup "to verify the test." I told her I'd just seen a heartbeat on the ultrasound monitor, and asked her if that were really necessary. She demurred. Then she proceeded to ask me for my email address for some enfamil and similac promotions. I asked her, "is this so they can start to spam me?" She laughed. I put down the pen. "Did you know," I said, "that sometimes these companies can not or will not take someone off a mailing list immediately if they have a miscarriage? That the woman has to endure constant reminders of her loss and everyone else's expectation until they can get their technology together?" She looked a little surprised. "I don't hold it against you personally," I said, "but not every pregnancy ends happily. Maybe this practice might want to think about how to be more sensitive to that fact, and perhaps wait a bit longer before connecting people with advertising aimed at newborns." She had less to say after that, and proceeded to hand me the same paperwork I'd been handed three times before in my life. I could have told her what it all said. While I'm cautiously optimistic, it's become clear to me just how limited people's perspectives are when it comes to issues of loss and infertility, even inside the doctor's office. Luckily, my neighbor was coming over for dinner tonight to keep me and the boy company, so I came home and quickly lost myself in the preparation of zucchini crusted pizza. (Thank you, CSA, for sending something besides lettuce.) 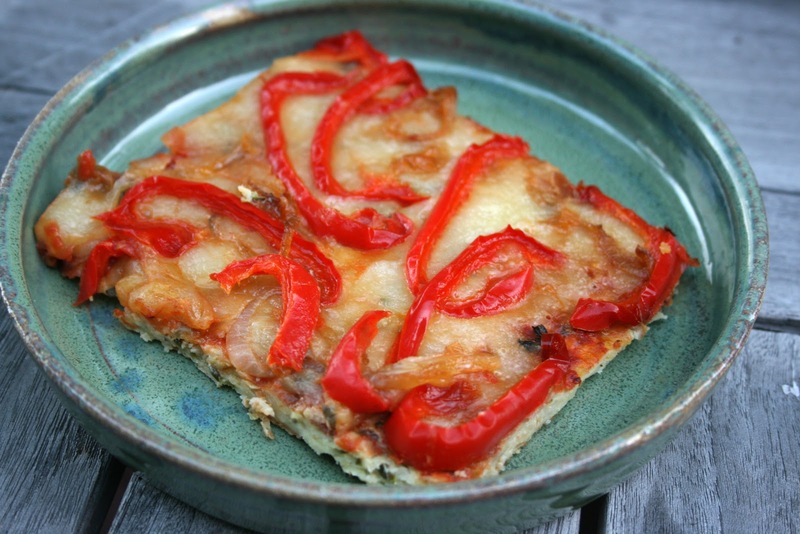 The original is from the Moosewood Cookbook, but it's been tinkered over the years; it's good summer comfort food. And it went really well with the mini ice cream cake my neighbor brought. I think she has a sixth sense. Tell us: what's YOUR favorite topping? Preheat the oven to 400 degrees F. Generously oil a 10 inch pie pan and coat lightly with flour. 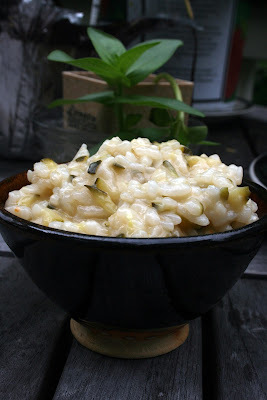 Combine zucchini, eggs, flour, mozzarella, parmesan, herbs and 1 T olive oil in a bowl and mix well. Spread into the prepared pan and bake for 35-40 minues or until golden brown. About halfway through the baking, brush with the remaining tablespoon of olive oil[optional].Remove from oven. When it has cooled for about 10 minues, use a spatula to loosen the crust from the pan so it won't break later. Top with your favourite pizza items and bake at 400 F until heated through. 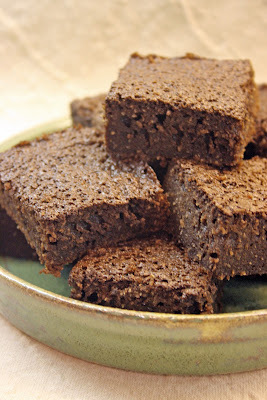 Though the other gluten-free baked goods I've tried so far have all been almost a little too moist, here, the moistness was perfect; the brownies were light, but fudgy at the same time. You could pretty easily make a vegan version of these by using egg replacer (like EnerG) or a half a banana for each egg (if you don't mind a very banana-tasting brownie ... which could be excellent!). They are particularly delicious when paired with fresh raspberries from, say, the bush in your back yard. Yes, the berry bonanza has begun! Every night we go pick some for dessert. I confess, tonight Ian and I probably ate about a pint between the two of us. Shameful. But so, so good. In a saucepan at low heat, blend together butter and cocoa powder. Remove from heat and let cool. In a medium bowl, mix together eggs, sugar, salt and vanilla. Add cooled cocoa mixture. Whisk coconut flour into batter until there are no lumps. Fold in nuts. Pour batter into a greased 8 x 8 x 2 inch pan. Bake at 350 degrees for 30 to 35 minutes. This is really becoming quite ridiculous, people. What is in the water? I've just found out that two more of my colleagues are pregnant: one--with twins!--who works in my building, the other who works in another office. Both of them due November/December. This makes six people at work, two people outside of work. Granted, I am now part of this happy sorority, but I feel my competitive spirit stirring. I see other people running the marathon in front of me, and I'm running, too. I want to finish the race, too, this time. It's is a twisted way of looking at it, I'm sure, but that's how my brain is wired. Now you understand why I need yoga. I've blogged before about the connection between fertility and black beans. Whether or not this is really true is anyone's guess. But you can be sure that I'm eating my share of the lovely legume, both because it's good vegetarian protein, and because, well, why not? Last week's CSA share included only 3 heads of lettuce (heaven be praised), arugula, spinach, chard (which got made into a frittata, so I didn't bother blogging about it), kale, and peas. Ian insisted that I do something different with the greens this week. No more stir fry, he protested. Not another frittata. So I came up with this concoction, involving black beans, which was happily devoured by both Y-chromosomed individuals in our house. And me. I suspect you could use just about any mid-flavored greens in place of spinach; this week, I think I'll try it with chard. Experiment and tell us how it went! 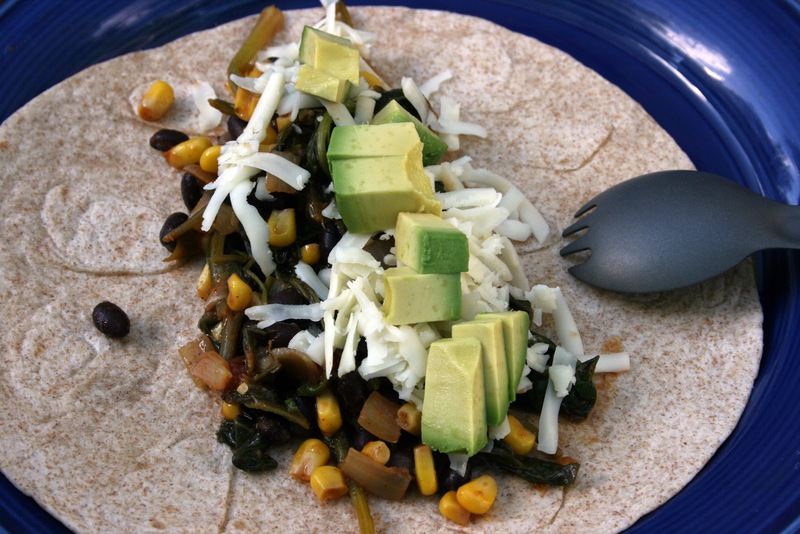 Fill tortillas with the bean mixture and your choice of toppings (cilantro through cheese) . 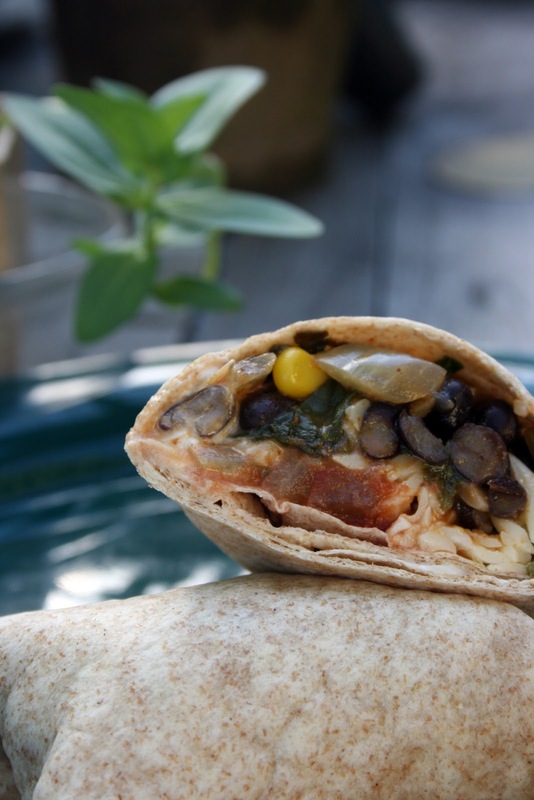 Fold tortilla in on both sides, then fold up the bottom. Lastly, fold down the top and press lightly. The steam from the hot filling with seal the tortilla. The first time I was pregnant, with Ian, I started to think a lot about nutrition. Though I'd been a pretty healthy eater before, I found myself seeking out more recipes with whole grains, cutting back on refined sugars, and eliminating caffeine entirely (even chocolate, for which I had an aversion during those nine months). I was lucky enough to be spared morning sickness entirely that first time, but I struggled to eat breakfast more regularly, which wasn't easy for a woman always on the run. Little did I know then what being on the run really meant. Now, as I dash out the door with my decaf latte (thank you, new espresso maker, for making milk drinkable), having made the lunches and breakfasts for the rest of the family and gotten Ian dressed and ready for school, I usually grab some fruit for the road. (Green smoothies just don't do it for me: I gave them a fair shake, but there's something unpleasant to me about the consistency.) The past two mornings, though, I've been feeling a little queasy, and my stomach clearly wants carbs. 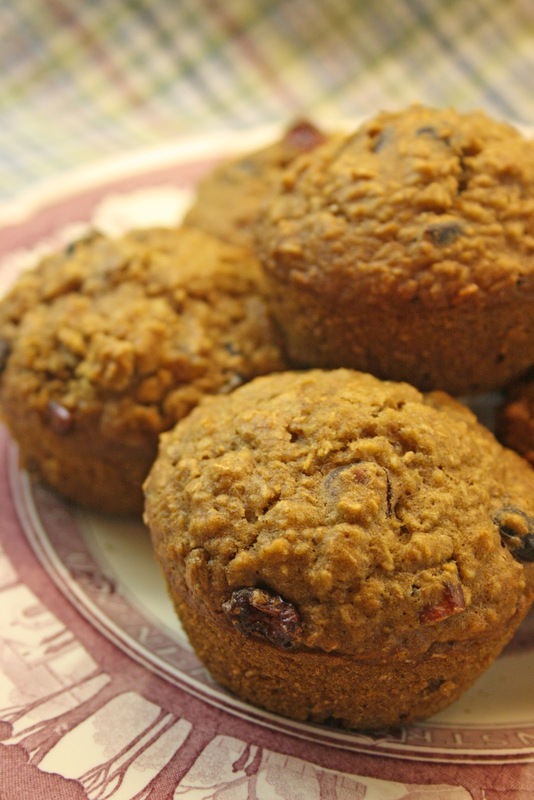 These muffins are a reliable stand-by in my recipe book: I often make them for people I know are on the go, but they're good for just about anyone. If you make the fruit juice version (and be careful about the labels on your dried fruits), you can avoid refined sugar entirely, and there's plenty of whole grain. They freeze well, so you can bake up a batch and toss one in the microwave in the morning. If you do happen to be pregnant, you've got something a bit more substantial than saltines to munch on. Lightly spoon flour into a dry measuring cup; level with a knife. Combine flour and next 7 ingredients (through salt) in a large bowl, stirring with a whisk. Stir in oats, dates, raisins, and cranberries. Make a well in center of mixture. Combine buttermilk, oil, vanilla, and egg; add to flour mixture, stirring just until moist. Stir in boiling water. Let batter stand 15 minutes. Spoon batter into 12 muffin cups coated with cooking spray. 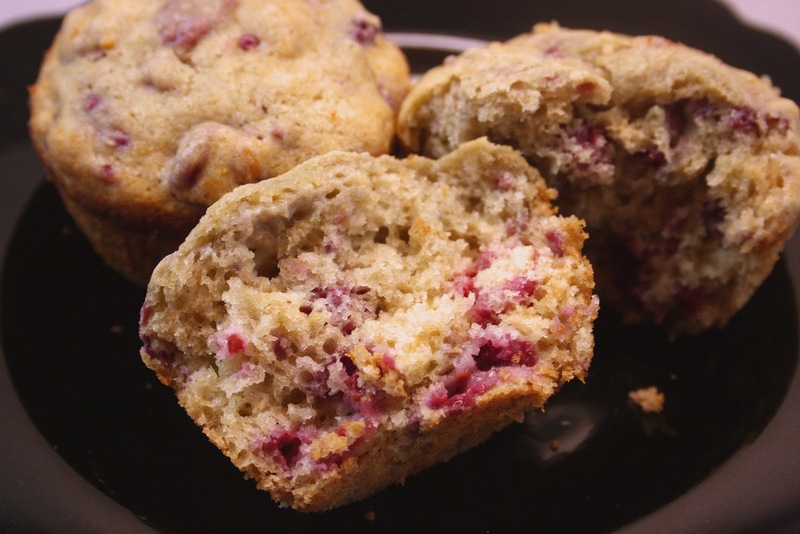 Bake at 375° for 20 minutes or until muffins spring back when touched lightly in center. Remove muffins from pans immediately; place on a wire rack. Why I am telling the blogging world about this when I won't even tell my own mother for at least another month or more, I don't know. But late last week I found out that my BFN ... wasn't. I almost don't know what to feel right now. I want to feel excited. But instead, it's like I'm waiting for it to go wrong, like it's only a matter of time before it goes wrong again. Am I doing this to protect myself? The timing couldn't have been more ironic: I'd barely started to adjust to the new medication, I'd just made the decision to start yoga teacher training in September, the due date will be at the beginning of the three busiest months of my work calendar (which means a leave that will be more working from home than actual leave time). You are all hereby sworn to secrecy. But I'm glad to have some people sending positive energy. We have a long way to go, and there are very few people who know me in "real life" that I can trust with this right now. The heroic effort to eat all of the CSA lettuce continues. 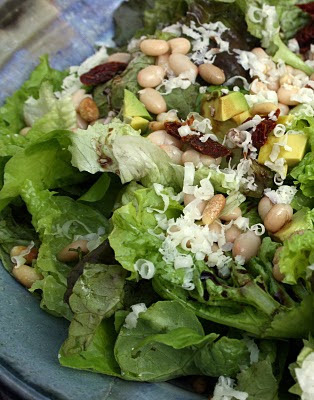 Ian helped me to make this salad, some of which he wanted to bring to school for lunch: small white beans, avocado, sun-dried tomato, toasted pine nuts, grated jack cheese (this at Ian's insistence) and a splash of good balsamic vinegar. The great thing about salad is that you can throw things together, intentionally, but not thinking about the end result, and have it turn out well. Flavors that might conflict actually end up complementing each other. You don't need to worry about proportions. The ingredients are individuals, but somehow they are also part of a larger whole. There is no right and wrong. Sometimes you surprise yourself. I've been reading Stephen Mitchell's introduction to the Bhagavad Gita and came across this: "The idea that there is a goal ... is wrong. We are the goal; we are always peace. To get ride of the idea that we are not peace is all that is required." While it's a leap to go from philosophy to salad, there is sort of a connection. Our small lives are so full of conflict, aren't they? Real or imagined, predetermined or manufactured. What would happen if we could simply let go of all of that conflict? Simply accept the end result, and observe and appreciate the flavors as a whole? This weekend we went away to Washington, D.C. to visit friends. We had a wonderful time gaping at dinosaur bones, standing in spacecraft, taking a tour that broke down half way through, playing in two fountains, sunning ourselves at the playgound, and riding the Metro. It was the sort of three day weekend that makes you wonder why you don't take more three day weekends. When we got back, our CSA box was waiting at our neighbor's house. We'd begged her to help herself to the bounty of greens, but alas! she did not. This weeks' catch: 4 heads of lettuce, 1 pound of spinach, a half pound each of collard and kale, 1/2 pound of arugula, 2 bunches of radishes, and a bok choy. So I've been cooking like a madwoman. Last night I roasted radishes, some of which I slipped into Ian's lunchbox this morning (lo! they were eaten! 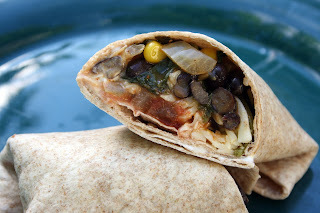 ), and made chickpeas and collards (a variation on this dish), while Steve made a tortilla with the kale. 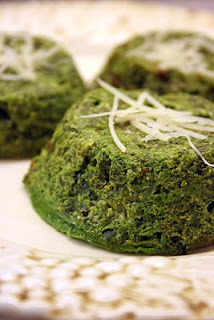 Tonight, I made these little spinach cakes, which I've been meaning to try for some time. The things I'm making this week have to be freeze-able because we got home too late to cook and eat on Monday, we're dining out tomorrow for our anniversary (is it sick that I almost want to stay home and eat salad? ), and on Friday I'm hosting a barbecue at work for the summer research students, which means three days we're not chipping away at the green mountain. I can't believe I'm about to say this, but I think I may need to learn how to put up my own vegetables this summer. Preheat oven to 400°F. Pulse spinach in three batches in a food processor until finely chopped. Transfer to a medium bowl. Add ricotta (or cottage cheese), Parmesan, eggs, garlic, salt and pepper; stir to combine. Coat 8 cups of the muffin pan with cooking spray. Divide the spinach mixture among the 8 cups (they will be very full). Bake the spinach cakes until set, about 20 minutes. Let stand in the pan for 5 minutes. Loosen the edges with a knife and turn out onto a clean cutting board or large plate. Serve warm, sprinkled with more Parmesan, if desired.